Abbreviated groups are used to represent (sub)structure with a text abbreviation and are useful tools for drawing large, complex structures or structures which has the same substructure ie. functional groups. MarvinSketch contains a default library of common abbreviated groups which can be accessed though the Insert<Group submenu. Typing the first character(s) of an abbreviation group the list of available abbreviated groups is displayed in th upper-left corner of the canvas. Besides the default abbreviated groups you can also set up your own user-defined groups (or redefine the default ones). Type the name of the abbreviation. Click on the canvas to place it. To complete a longer name, press ENTER or END after typing the first few characters. Group abbreviations are case sensitive: e.g., typing either "NO" or "no" both lead to the nitrosyl (NO) functional group, while typing "No" displays the atom symbol of nobelium. Similar groups: Ac, Am, Ce and Pr. If the cursor was placed over an atom, it will be automatically changed to the abbreviated group. If no atom was selected, the abbreviation is placed on the cursor. Clicking with it places it on the canvas. To ungroup an S-group before placing it to the canvas, press the SHIFT button before you release the mouse on the desired location. You can retrieve the hidden structure from the text abbreviation with the "Expand" function and hide the structure with the "Contract" function. Manipulation with abbreviated groups is possible with "Expand", "Contract", "Ungroup", and "Remove" options from the Structure > Group submenu or by right-clicking for the contextual menu on an existing group. For hints how you can customize the Editor see the Customize MarvinGUI section. Contract: if there is one group selected contracts to its abbreviation, otherwise contracts all groups in the canvas. Expand Group: displays the full structure instead of a contracted group if there is one group selected, otherwise expands all groups in the canvas. Ungroup: removes all abbreviated groups from the selection or from the canvas. The structures will remain, but will no longer be associated with their abbreviations. Note that Marvin gives priority to the user-defined abbreviated groups and overrides the default after redefinition. The display of the attachment point(s) can be switched on/off using the View<Advanced<S-group Attachments option. After creating the abbreviated group (see previous section), right-click the corresponding atom and choose Add S-group attachment or select the atom and use the same option in the Atom menu. The attachment point is marked by a number in a green rectangle. The display of the attachment point(s) can be switched off from the View<Advanced submenu. There is no limit to how many attachment points can be added to an abbreviated group; they will be numbered in the order of their creation. Similarly, an atom of the abbreviated group can have more attachment points. Bonds will connect to group atoms through their first free attachment point ( with the exception of amino acids). Only attachment points not involved in bonds are marked by numbers in the expanded abbreviated group. To removal an attachment point select the Remove S-group attachment option either from the contextual pop-up menu or from the Atom menu. If the selected atom has more than one attachment points they are deleted in descending order. Besides the default abbreviated groups you can also set up your own user-defined groups or redefine the default ones. Click the Group button in the Tools toolbar then select the group atoms and bonds. or upon releasing the mouse button, the "Create group" dialog window pops up (this dialog window may be opened from the Structure > Group submenu as well or use the CTRL+G shortkey. Name the group in the dialog window. 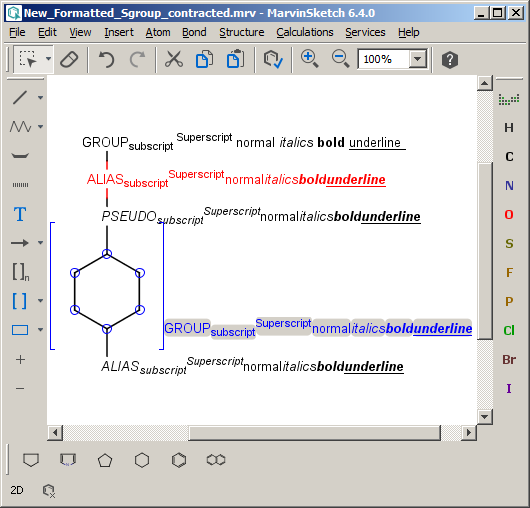 To format you abbreviated group use the Atom Label editor tool. The abbreviated groups can be added to the Templates. Right-click and select "Add to My Templates" from the contextual menu. The structure is added to the Advance Template Toolbar by default. The Atom label editor tool allows you to change characters to bold, italic, super- and subscript and insert symbols. Color, font type and size can be set using the Format... option from the contextual menu. Marvin stores its default groups in a formatted .txt file named default.abbrevgroup and by adding your own group file you can complement the default. To assemble your own .abbrevgroup file you should strictly follow abbreviated groups file format. The newly defined file must be named user.abbrevgroup and should be stored in the chemaxon folder of your home directory in your file system. Select the structure and using the 'Create Group' dialog name it. If your already has created user-defined abbreviated groups copy the content of the dialog box to your file. The label of the abbreviated groups can be formatted, by adding the graphicalMarvinProperty::FormattedLabel property to the abbreviated group atom. Numbers are automatically subscripted unless "\n" is used or at the start of string. Charges (+, -, ++, --, 3+ etc.) are automatically superscripted at end of string or if the following character is a closing parenthesis. To expand examples click here.